With the release of Flash Player 11, which includes the hardware accelerated Stage3D API, the number of 3D games, applications and online 3D experiences is likely to increase dramatically over the coming years. The Stage3D API is powerful but extremely complex(aka it would take a very steep learning curve to actually take advantage of it). Fortunately, there are frameworks you can use to simplify 3D development in Flash-such as the very popular open source 3D engine Away3D. With that said say hello to James Wagstaff. James Wagstaff is a developer for aro.ie and pictureandword.com. In the following hour James will get you started with Away3D 4.0 that uses the new Stage3D added into flash in flash player 11. 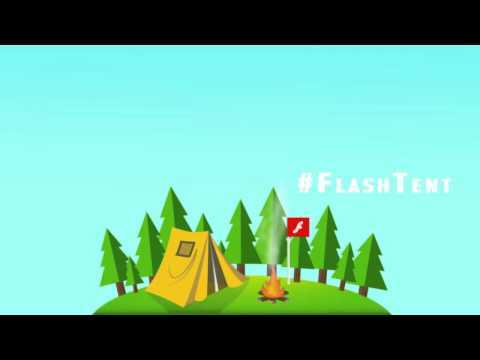 In this video we get to know who he as he jump starts his session compare alternatives and get our feet wet building our first 3d element in flash! The newest version of Away3D 4, has been upgraded to support the latest Flash Player 11 with fully GPU accelerated graphics, freeing up the CPU for other computational tasks. Since Graphics Processing Units are capable of rendering many more textured triangles per second, it allows for much more detail and quality, and up to 100,000 triangles per frame instead of the typical 1,000. The Away3D project also maintains flavors of the source code for Flash Player 10 with limited 3D GPU acceleration, for Flash Player 9 and below, and Away3DLite, a compacted version of the engine. Stage 3D, previously codenamed "Molehill," is a new method/model of 2D and 3D rendering developed by Adobe and supported with a new Stage3D API-a set of low-level GPU-accelerated APIs enabling advanced 2D and 3D capabilities across multiple screens and devices (desktop, mobile, and TV) through the Adobe Flash Platform runtimes. These APIs provide advanced 2D and 3D developers with the flexibility to leverage GPU hardware acceleration for significant performance gains. Adobe Flash Player previously rendered thousands of non z-buffered triangles at approximately 30 Hz. With the new Stage3D APIs, you can expect hundreds of thousands of z-buffered triangles to be rendered at HD resolution in full screen at around 60 Hz. Using the new Stage3D APIs in Flash Player and Adobe AIR will make it possible to deliver sophisticated 3D experiences across almost every computer and device connected to the Internet. In layment terms in our case. software isn't the ideal render of graphics while we have a graphics card(every computer has one) so why not put that heavly lifting on the graphics card that actually is optimized for this type of work and let flash (in our case) hand over to components on our computer to do the things they do best. Adobe has been in the latest versions of flash opeing up these capabilities such as the Native Mouse cursor for Flash Player 10.2 , stageVideo for Flash player 10.2 and now Stage3D for Flash Player 11 .